Vehicles today are more complex than ever. As a result, it's easy to not accurately identify or capture all the vehicle features and specs of a particular vehicle. An advanced VIN decoder will identify what's encoded in the vehicle's VIN number, as well as installed and available optional equipment, and other vehicle details. 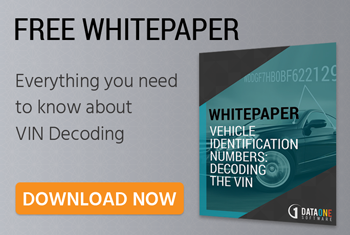 Some use cases where a VIN decoding solution is particularly valuable include listing inventory, quoting insurance policies, servicing vehicles, ordering the correct vehicle parts, and etc. The majority of car insurance providers require consumers to provide their vehicle's VIN number before giving a quote or insuring them. Not only is the VIN helpful for accurately identifying vehicle features and specs, as mentioned above, but also guarantees that the insurance provider is insuring the correct vehicle. Relying on the consumer's vehicle description isn't enough. As President Ronald Reagan said, "trust, but verify." The VIN number will do just that, as each VIN can only be registered to one driver at a time. It seems like there's never enough time in the day to get everything done. Manually updating your vehicle inventory or plugging in YMM to identify each vehicle's details can be tedious and time-consuming. Especially since many of these steps can be automated with help from a bulk VIN decoder. Nearly marketing-ready Inventory listings can be generated through a VIN decoding solution with the click of a button. Identifying vehicle details with a VIN scanner is another great way to maximize efficiency. VINs are unique to each vehicle and carry the vehicle's history throughout its life. Therefore, only VIN lookup will obtain vehicle history. If you're dealing with used vehicles, whether it's selling pre-owned inventory, purchasing them for your fleet, insuring them, etc., you should have access to a vehicle history report provider like Carfax or AutoCheck. Many consumers often get confused about the differences between a VIN decoder, VIN check tool, and vehicle history reporting tool, so we wrote an article to help clarify. Year, make, model search can be used for general safety recall information, however, it will not tell consumers if their vehicle has an open recall. A VIN lookup option is essential for consumers to identify open recalls on their vehicle or a vehicle they are looking to buy, as it is vehicle-specific. Here are some great recall resources we highlighted in our Takata airbag recall blog article. VIN lookup is superior to year make model. However, you shouldn't scrap YMM. The combination of VIN lookup and YMM search will allow your business and consumers to identify as many or as few vehicle details necessary.